When decorating any room in your house, area rugs have become a natural and significant accessory. A wool rug can be a bold, yet tasteful piece that can bring all the elements of room decor together. Each rug will personalize a room in a different way, conveying a certain meaning, whether warm and inviting, elegant and formal or anywhere in between. In order to keep your room looking its best, a professional wool rug cleaning is going to be needed on occasion to help extend the life of the rug and to keep its vibrant look. Persian and Oriental area rugs are very distinct in their bold colors, rich designs and patterns, old weaving traditions, and ancient stories of tribal origin. True Oriental rugs are handmade, are very expensive, and have an exotic, old world charm. These handmade Oriental rugs are made out of wool or silk, with symmetrical and intricate designs. Although you can vacuum and maintain your Oriental wool rug at home on a weekly basis, Persian and Oriental wool rug cleaning need careful attention and consideration by professional area rug cleaners. Cleaning Oriental rugs at home is not recommended, and all rug manufacturers will assure you of this. Dyes may bleed and harsh cleaning solutions may damage the fiber. Natural wool rugs, such as those made from 100% New Zealand wool fibers, are often more subtle than Persian and Oriental rugs. The colors of natural wool area rugs are subdued, muted and neutral, not bright, vibrant and bold, as those of Oriental area rugs. 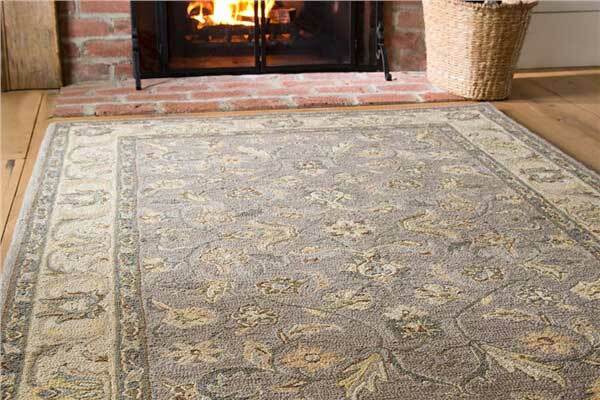 Often, these area rugs are available in a limited selection of colors due to limited natural wool colors. The patterns, if any, are very simple and straightforward, not intricate and elaborate. Natural wool area rugs are all about simplicity: simplicity of design, color, and style. They are, however, very practical and are usually easy to take care of, especially with regular vacuuming and immediate attention to spots and spills. Persian and Oriental rugs, as well as natural wool area rugs, have unique cleaning requirements that should be evaluated by professional area rug cleaners for optimal results. When area rug cleaning is attempted at home, results cannot be guaranteed. In fact, lovely area rugs are often ruined in the process. Damage done to the rug may be irreversible; also, such experiments may ruin beautiful and expensive Oriental or natural wool rugs. All rugs should be professionally cleaned regularly. That schedule is based on use conditions and type of rug. Why can’t my rug be cleaned in my home? Would you simply wipe off a sweater and consider it clean? Cleaning wool rugs on-site only allows us to perform a surface cleaning of the rug. Removing deeply embedded dry particulate soiling is not possible in your home. We proudly wash your rugs in North Carolina’s premier rug washing facility! If anyone else cleans your rug, it’s still dirty!